As we get closer to our closing date on our condo and our subsequent move, I find myself returning again and again to my reliable quick meal repertoire. I have begun to pack up the kitchen. Some of it is easy to set aside for a while. The waffle maker, the cookie cutters, the cake rings, the chinois, the Bundt pans, the brioche molds, the rectangular tart pan, the coffee urn, the ramekins, the pots de creme jars, and about two-thirds of the barware have all gone into boxes. And despite my affection for those things, I have yet to find myself reaching for them in my ordinary day-to-day routine. But those are special occasion kinds of equipment. They are not the skillets and saucepans and spatulas and mixing bowls and knives and cutting boards that I seem to dirty and wash for nearly every meal. I’ve had to prioritize as I’ve tried to pack a box or two each day while keeping them liftable and the apartment livable (and showable…anyone in Chicago looking for a two bedroom apartment in Andersonville available November 1?). I debated over the pressure cooker and decided to pack it. When it came to the food processor, I decided to keep it out a while longer. 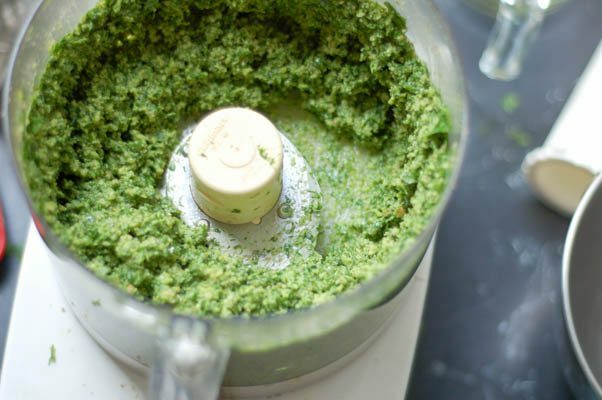 A big reason for needing access to the food processor was this pesto. When most people think of pesto, they usually think basil. And there’s nothing wrong with that. I have made and eaten plenty of basil pesto and will undoubtedly continue to do so. But plenty of other herbs can shine when crushed and mixed with nuts and cheese and olive oil. 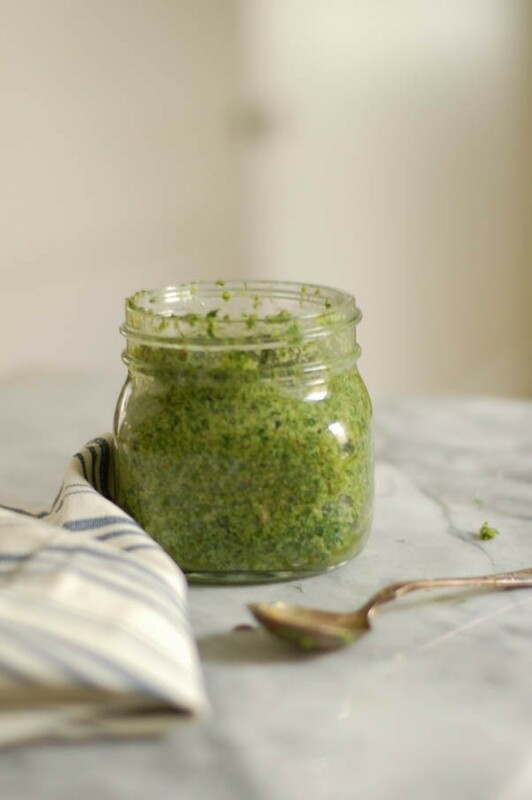 Lately, I’ve been enamored with a pesto made with dill and flat leaf parsley. It tastes incredibly bright and green. All that herbaceousness is tempered with toasted walnuts, a smattering of pecorino romano, and a healthy drizzle of extra virgin olive oil. I’ve been slathering this stuff on usual suspects like pasta, but I’ve also been tossing roasted potatoes in it, topping frittatas with it, and spreading it on toast. It would be a great sauce for fish or seafood or spread for a tomato sandwich. I’m also convinced it would, with the addition of some tomatoes and perhaps some cucumbers, make a great topping for quinoa cakes. It comes together in minutes and keeps for a couple of weeks. I’ve been keeping a jar of this around in the refrigerator so that I have an easy solution to the question of how to get some kind of fresh and delicious meal together when I’m more concerned keeping the kitchen easy to clean before a potential tenant comes over than I am in spending a leisurely hour puttering around the stove. Maybe now that I have another batch of it, I can pack that food processor tomorrow. 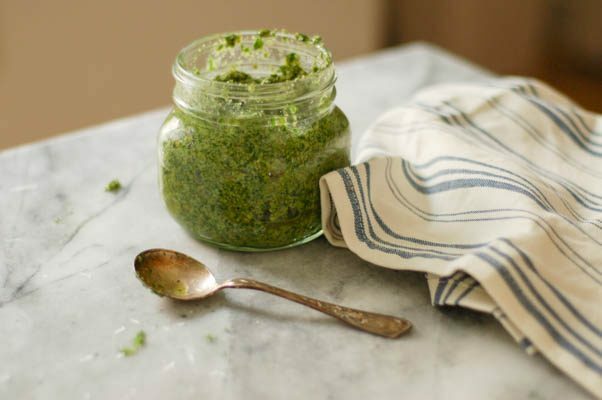 Rather than relying on the usual basil, this pesto uses dill and flat leaf parsley for its bright green color and herby flavor. 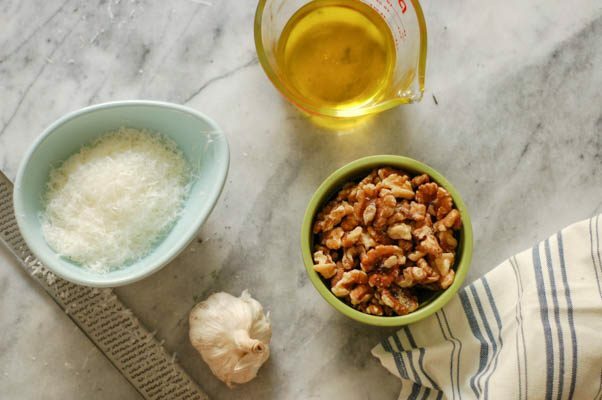 It uses toasted walnuts and pecorino romano instead of the traditional pine nuts and parmigiano reggiano. 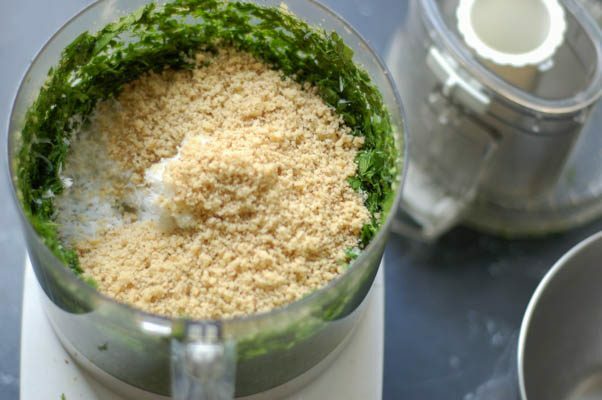 It comes together in the food processor in a few minutes. I find the dill and parsley are less prone to oxidation than basil pesto, which tends to turn funny dark colors in a few days of storage. This keeps well in an airtight container in the refrigerator for at least two weeks. I love this as a sauce for pasta, but it’s also great on roasted potatoes, fish or seafood, eggs, toast and plenty of other vegetables, starches or proteins. 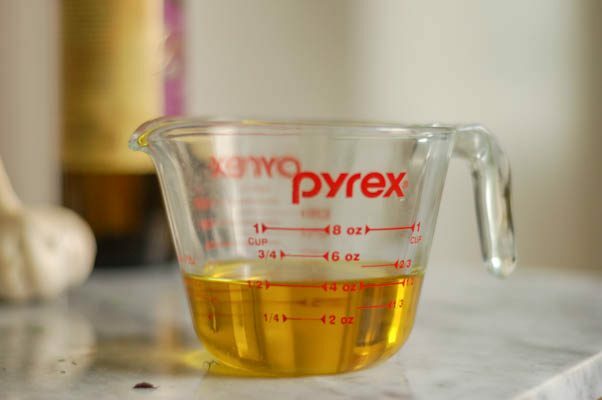 I like it best when the final dish includes an acidic note from tomatoes or a squeeze of lemon juice. I find that grinding the walnuts first and then adding them back in the end improves the final texture of the pesto. 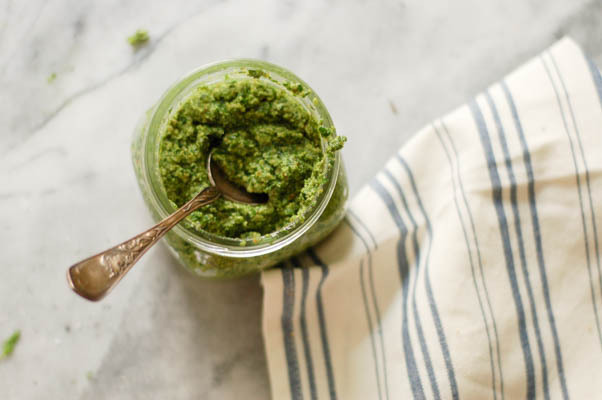 If you’re feeling especially lazy (and there’s no shame in that), you can throw them in with garlic and herbs and still have a respectable pesto. 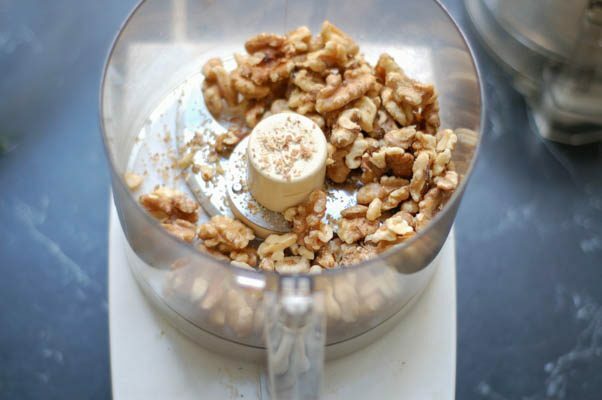 In the bowl of a food processor, add the walnuts and pulse until they are ground into fine crumbs. Transfer them to a bowl. 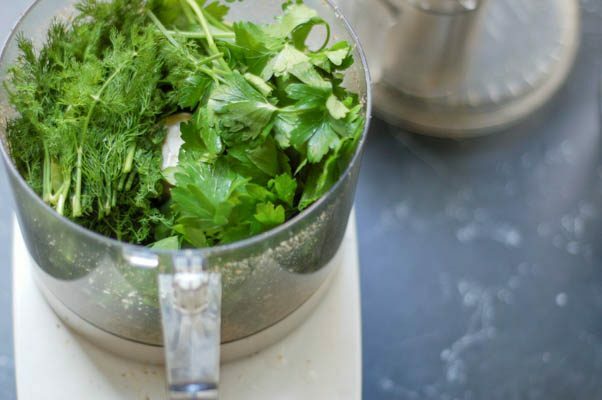 Wash the dill and parsley in cold water and shake dry (or pat dry on paper towels). Trim off the thick stems below the leafy part of the herbs. Don’t worry about the thinner stems–they’ll be fine after a whirl in the food processor. 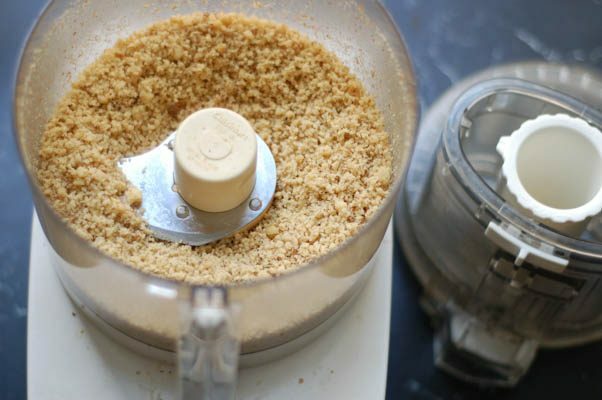 Add the garlic to the food processor, pulse until it’s in small bits. Add the dill and parsley and pulse until the leaves are minced. Add the ground walnuts, the pecorino romano, and salt, and pulse a few times to mix. Add the extra virgin olive oil and pulse until blended. I think you meant 3 – 4 ounces grated pecorino romano, not 3/4 ounce as stated in recipe. 3/4 ounce pecorino does not equal 3/4 cup pecorino. Actually, when finely grated on a microplane, 3/4 of an ounce of pecorino *does* equal about 3/4 cup in volume. If it is more coarsely grated then it may be more compact. I’d go with the weight rather than the volume if you find them contradictory. This doesn’t require tons of cheese, just a bit for some tang and richness. This sounds amazing! I am thinking it would be good on some crackers for a snack today! 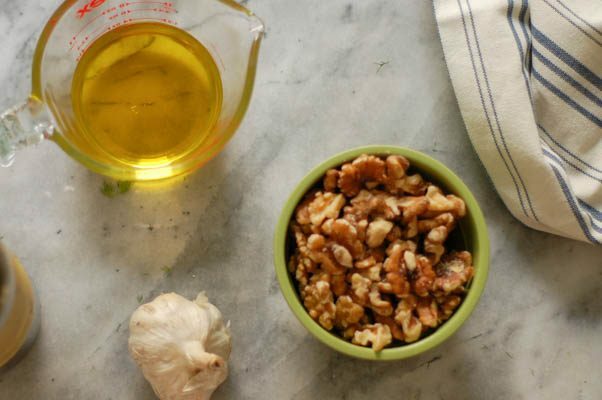 I’ve always seen and made pesto recipes with pine nuts but have never considered walnuts before. I will have to try this. It looks delicious! This sounds like a great flavour combo! I’d probably just end up spooning it out of the jar! This looks absolutely lovely and delicious! Thanks for sharing this incredible recipe. 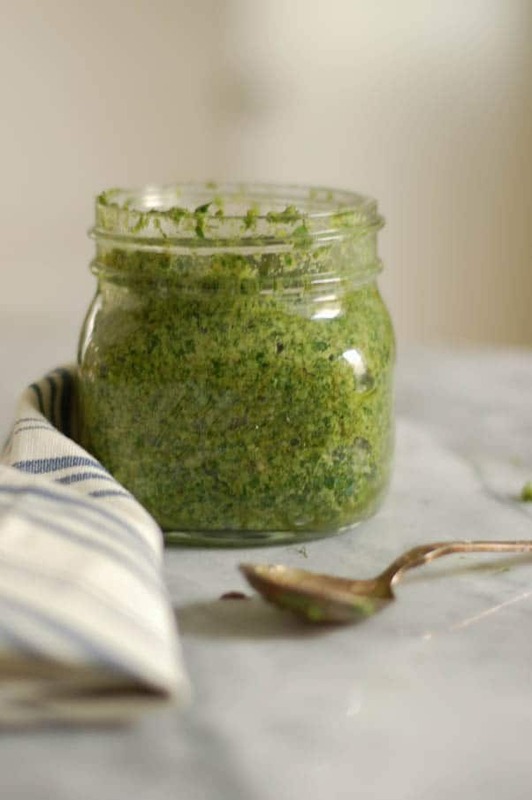 I have made pesto with lots of different herb/greens combinations, but never dill. I can almost taste what it would be like on top of salmon, although spreading it on some nice, toasted pumpernickel sounds fantastic too!